With the Driftwood Hexagon Glass Wall Tile, it's easy to add a splash of contemporary styling to your decor. This attractive tile features 2 in. hexagon brick pieces on 11.02 in. x 12.76 in. mesh sheet that makes installation a much easier process. Constructed from durable, frost-resistant glass material, this tile is suitable for installation on walls and countertops. The attractive combination of handsome brown and warm beige tones, an unglazed, smooth finish, a high sheen and subtle variations in tone makes a perfect complement for a wide variety of design schemes. 14.65 square feet, 15 pieces per case. Case weight is 45 lbs. The Merola Tile Tessera Piano Bizancio 11-3/4-inch x 11-7/8-inch x 8 mm Glass and Stone Mosaic Tile is a dark, striking mosaic that features a sophisticated mix of glass and stone textures. Smooth glass and tumbled gray natural stone mix beautifully to create a multi-dimensional effect. The piano-style format of the tile lends a contemporary touch. Use this mesh-mounted mosaic as field tile or cut into strips to use as an accent to other tiles. The Merola Tile Tessera Piano Breno 11-3/4-inch x 11-7/8-inch x 8 mm Glass and Stone Mosaic Tile is a medium neutral-toned mosaic that features a sophisticated mix of glass and stone textures. Smooth glass, frosted glass and tumbled natural stone mix beautifully to create a multi-dimensional effect. The piano-style format of the tile lends a contemporary touch. Use this mesh mounted mosaic as field tile or cut into strips to use as an accent to other tiles. Our Tessera Piano Ming 11-3/4 inch x 11-7/8 inch x 8 mm Glass and Stone Mosaic Tile is a bright white-green mosaic that features a sophisticated mix of glass and stone textures. Smooth glass, frosted glass and tumbled natural stone mix beautifully to create a multi-dimensional effect. The piano-style format of the tile lends a contemporary touch. Use this mesh-mounted mosaic as field tile or cut into strips to use as an accent to other tiles. Due to the nature of green ming marble, variation between sheets is expected. Tile is the better choice for your space. This tile is made from natural ingredients, making it a healthy choice as it is free from allergens, VOCs, formaldehyde and PVC. With its sophisticated, contemporary style, the Merola Tile Tessera Piano Stonehenge 11-5/8-inch x 11-3/4-inch x 8 mm Glass and Stone Mosaic Tile enhances your walls. The smooth glass and tumbled brown and gray natural stone textures provide a multi-dimensional effect. Use this mesh mounted mosaic as field tile or cut into strips to use as an accent to other tiles. Driftwood Hexagon 11.02 Inch x 12.76 Inch Glass Mesh-Mounted Mosaic Tile (14.65 sq. ft. / case) With the Driftwood Hexagon Glass Wall Tile, it's easy to add a splash of contemporary styling to your decor. This attractive tile features 2 in. hexagon brick pieces on 11.02 in. x 12.76 in. mesh sheet that makes installation a much easier process. Constructed from durable, frost-resistant glass material, this tile is suitable for installation on walls and countertops. The attractive combination of handsome brown and warm beige tones, an unglazed, smooth finish, a high sheen and subtle variations in tone makes a perfect complement for a wide variety of design schemes. 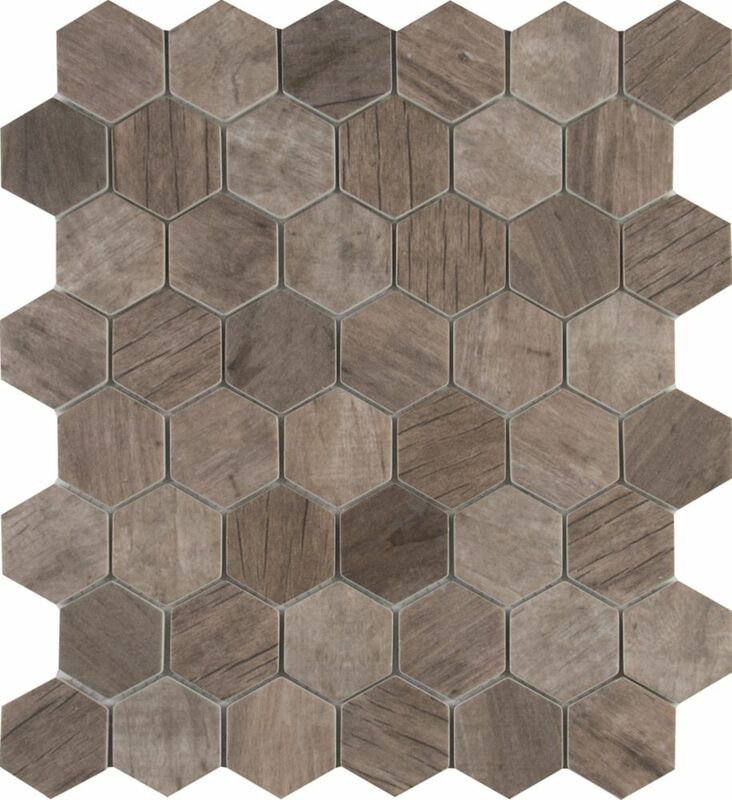 Driftwood Hexagon 11.02 Inch x 12.76 Inch Glass Mesh-Mounted Mosaic Tile (14.65 sq. ft. / case) is rated 4.6 out of 5 by 25.